A recent market study published by the company titled “Generic Oncology Drugs Market: Global Industry Analysis 2013–2017 and Forecast 2018–2028” consists of a comprehensive assessment of the most important dynamics of the Generic Oncology Drugs market. Upon conducting comprehensive research on the current growth parameters of the Generic Oncology Drugs market, the growth prospects of the market are obtained with maximum precision. The report features the unique and salient factors that are likely to have a significant impact on the development of the concerned market during the forecast period. The report provides detailed information about the current and future growth prospects of the concerned market in the most comprehensive manner for the better understanding of readers. The report commences with an executive summary of the Generic Oncology Drugs market report, which includes a summary of the key findings and key statistics of the market. It also includes the market value (US$ million) of the leading segments of the Generic Oncology Drugs market. Readers can find a detailed taxonomy and definition of Generic Oncology Drugs products in this chapter, which will help them understand the basic information about the concerned market. The definition section considers the factors included as well as excluded for the purpose of this report. This chapter highlights the key market dynamics, which include the drivers, restraints and trends. In this chapter, readers can understand the factors that are propelling the growth of the market along with the factors that are likely to deter the growth of the market. Moreover, readers will understand the key trends followed by the leading manufacturers in the Generic Oncology Drugs market. Key pointers, such as PESTLE Analysis and Regulatory Scenario, are also included in the report. This chapter shows the Generic Oncology Drugs Pipeline on a much broader scale with regular details. This chapter includes a detailed analysis of the growth of the North America Generic Oncology Drugs market, along with a country-wise assessment that includes the U.S. and Canada. Readers can also find historical trends and market attractiveness based on molecule type, route of administration and distribution channel for the North America region. Important growth prospects of the Generic Oncology Drugs market with market attractiveness based on molecule type, route of administration and distribution channel in several Western European countries, such as Spain, UK, Germany, Italy, France and the Rest of Western Europe, are included in this chapter. Important growth prospects of the Generic Oncology Drugs market with market attractiveness based on molecule type, route of administration and distribution channel in several Eastern European countries. This chapter includes a detailed analysis of the growth of the Latin America Generic Oncology Drugs market along with a country-wise assessment that includes Brazil and Mexico. Readers can also find historical trends and market attractiveness based on molecule type, route of administration and distribution channel of Generic Oncology Drugs in the Latin American region. India, ASEAN and Australia & New Zealand are the leading countries in the APECJ region that are the prime subject of assessment to obtain growth prospects for the APECJ Generic Oncology Drugs market. In this chapter, readers can find detailed information about the growth parameters. Readers can find important factors that can have a significant impact on the growth of the Generic Oncology Drugs market in Japan based on the market segmentation during the forecast period. This chapter provides information about how the Generic Oncology Drugs market will grow in the major countries in the MEA region, such as GCC Countries and South Africa, during the period 2013-2028. Forecast factors set for the estimation of the entire concerned market are also present in this section. This section highlights Global Generic Oncology Drugs value in different regions, the overall global market value (US$ Mn), forecast and analysis. 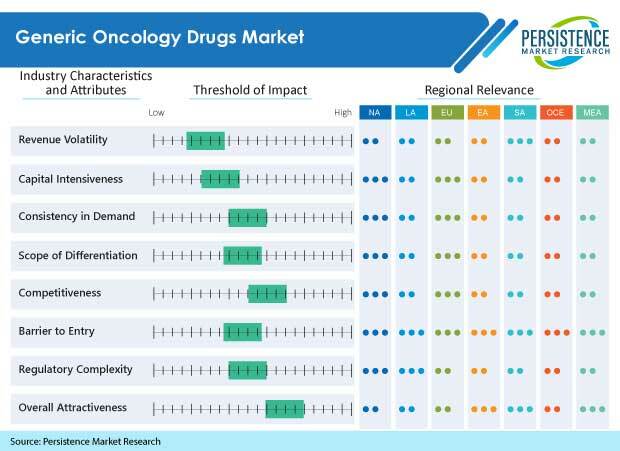 Based on the Region, the Generic Oncology Drugs market is segmented into North America, Latin America, Western Europe, Eastern Europe, APECJ, Japan, China and MEA. Based on Molecule Type, the Global Generic Oncology Drugs market is segmented into large molecule and small molecule. Based on Route of Administration, the Global Generic Oncology Drugs market is segmented into Oral and Parenteral. Based on Distribution Channel, the Global Generic Oncology Drugs market is segmented into Hospital Pharmacy, Retail Pharmacy, Online Pharmacy and Managed Care Institutions. This section highlights the Generic Oncology Drugs market value, the overall global Absolute $ Opportunity, forecast and analysis. This section consists of a glossary of assumptions and acronyms used in the Generic Oncology Drugs market report. This chapter helps readers understand the research methodology followed to obtain various conclusions, important qualitative information and quantitative information about the Generic Oncology Drugs market. The entire scenario for Generic oncology drugs has observed substantial growth over the period. It is mainly due to increase in number of identified cancer cases over the years. Unending research create a background for further product innovation in the oncology drugs. Over the past five years, 70 new oncology treatments have been launched and are being used to treat over 20 different tumor types supported by most of the regulatory bodies around the globe. Generic Oncology Drugs are the next breed of cancer medicines which comes with an affordable price shift and quality assurance. There is growing focus towards development of nanotechnology based generic oncology drugs which could prove to be of superior quality. Generic Oncology Drugs has grown into an effective treatment option for indicative cancer cases, the manufacturers on the other end are focusing on introducing new product with quality difference over present product. The growing importance on the research and development of drugs and therapies for cancers such as lung, colorectal, multiple myeloma, and prostate, is expected to create an immense growth opportunities for generic oncology drugs market. In the current standard for drug manufacturing, generic oncology drugs present a prospect for drug manufacturing companies to generate significant revenues. The most certain cases are observed in emerging economies like India, Brazil, China and Israel. Where domestic manufacturers of generic oncology drugs have initiated a trend of coming up with suitable drug to counter most of the cancer indication. Loss of patents for most the branded drugs leave a great chance for the generic oncology drugs manufacturers to get their return on due basis. Most of the generic drugs being manufactured have a direct relation to the government support. Such case of direct challenges to intellectual property rights holding high priced drugs such as imatinib (Glivac) in India shows the opposite side of it. As vast majority of generic cancer drugs are subjected to only one approval regulation and that is for the active pharmaceutical ingredient it is using in the manufacturing. Government authorities can assure a quality controlled manufacturing facility for generic oncology drugs may meet the standards where branded drugs are manufactured. Most generic drug regulators don’t require generics to undergo phase IV post-marketing studies as compare to branded drugs. They have that edge in order to be in the market at a much early stage. Most economies are organizing to boost indigenous production of generic Oncology drugs by giving attractive reasons to local drug manufacturers. The best option provided by the government is availability of reimbursement for critical drugs which most certainly boosts adherence to prescription. Rising government and private funding in drug manufacturing infrastructure in emerging economies wound inflate the market in coming years. Government initiatives with rising focus on contract manufacturing of small molecule and biopharmaceuticals is going to increase the product depth and scope for generic oncology drugs. The report on the Generic Oncology Drugs market details information on the marketing strategies observed by the Generic Oncology Drugs companies. The study includes inclusive data on each, including Novartis AG, Pfizer Inc., GlaxoSmithKline plc, CELGENE CORPORATION, Teva Pharmaceutical Industries Ltd., Merck & Company, Inc, Aurobindo Pharma., Hikma Pharmaceuticals PLC, Mylan N.V. and NATCO Pharma Limited. Details in the Generic Oncology Drugs market report include market revenue shares of product manufacturers, and current trends followed by most of the market players in Generic Oncology Drugs, apart from many other fundamental dynamics. The Generic Oncology Drugs market study delivers a deep drive research on factors associated with the market involving most crucial aspects regarding the the future growth and quality difference the market requires to avoid in order to have a growth in Generic Oncology Drugs market during 2018-2028. Buyers can find the most positive practices associated with the market with involved market dynamics and information both in terms of value and quality. Factors involved in the growth for manufacturers for Generic Oncology Drugs is well discussed. The Generic Oncology Drugs market is segmented as per geography, molecule type, route of administration, and end user, to evaluate the section-wise profits growth of the Generic Oncology Drugs market. Based on geography, the market is segmented into seven regions – Western Europe, Eastern Europe, Latin America, North America, China, Middle East & Africa (MEA) and Asia Pacific Excluding China (APEC). The Generic Oncology Drugs molecule type is segmented into– Large Molecule and Small Molecule. By route of administration, the Generic Oncology Drugs market is segmented into Oral and Parenteral. By Distribution Channel, the Generic Oncology Drugs market is segmented into Hospital Pharmacy, Retail Pharmacy, Online Pharmacy and Managed Care Institutions. Which kind of Molecule type accounts for the maximum share in the production of generic oncology drugs? Why is it so? Why are developed nations not reacting to as progressively as the emerging economies? The process of market research followed at the company commences with extensive secondary research of the Generic Oncology Drugs market. Analysts obtain industry-validated, historic, and current data about the demand for Generic Oncology Drugs across the globe. Comprehensive secondary research is followed by extensive and in-depth primary research, where detailed information about the Generic Oncology Drugs market is obtained in terms of value (US$ Million). Based on thorough secondary and primary research of the growth parameters of the Generic Oncology Drugs market, analysts come up with the most precise forecast on how the Generic Oncology Drugs market will grow during the forecast period.